Our doctors are medical oncologists who specialize in breast cancer treatment. As faculty members of Weill Cornell Medical College and attending physicians at NewYork-Presbyterian Hospital, our physicians are active in teaching and research as well as patient care. We hold multidisciplinary conferences on a weekly basis to coordinate and tailor individualized treatment programs. Our infusion center features comfortable, semi-private units bathed in natural light. Each patient also has a personal television and wireless Internet access. 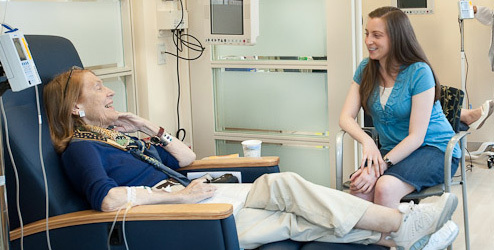 Our nurses and on-site pharmacist perform quality assessment checks for every dose of chemotherapy administered. Our pharmacist is readily available to answer questions about issues such as drug interactions and side effects. We offer complementary therapies–such as guided imagery, therapeutic touch, progressive relaxation, and aromatherapy–to help manage symptoms. Consultations with a registered dietitian are available for guidance regarding nutritional issues and weight gain during treatment and beyond. Our Survivorship Program sponsors educational seminars and an annual luncheon to learn about advances in breast cancer care and related topics. Women being treated at the Breast Center have access to the world-class care available through NewYork-Presbyterian/Weill Cornell Medical Center. Our staff will gladly help coordinate referrals. Most of our physicians accept major forms of medical insurance. Once your doctor outlines your treatment plan, our account administrators can help you with any insurance and financial issues, such as verifying insurance coverage, obtaining authorizations, planning for out-of-pocket expenses, and setting up a payment plan if needed. Click here for the Helmsley Guest Facility website. The NewYork-Presbyterian Guest Facility is located next door to New York-Presbyterian Hospital/Weill Cornell Medical Center and the Hospital for Special Surgery. This location makes the NewYork-Presbyterian Guest Facility at the Helmsley Medical Tower ideal accommodations for you and your family if you are scheduled for early morning medical tests or hospital admission, or if you need follow-up medical attention following hospitalization. The facility is also the answer when you require extended outpatient hospital care or want around-the-clock proximity to a hospitalized loved one.